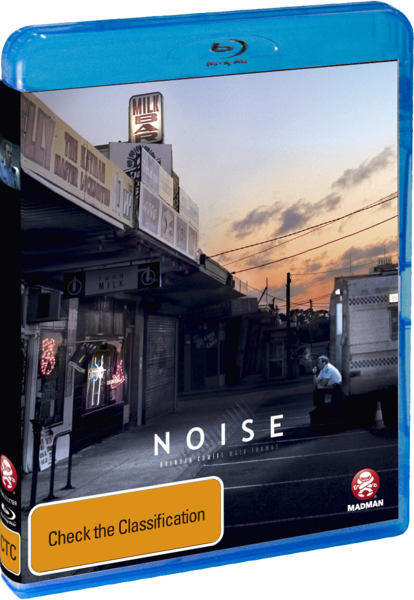 Noise is now available on Blu-ray and if you missed this release the first time around, this is the perfect jumping point. With glorious Blu-ray FULL HD and a thumping Dolby Digital 5.1 surround sound soundtrack, Noise on Blu-ray is almost like a cinematic experience. Best of all, the Blu-ray version comes with a healthy dose of extras that will give you unbarred access to the creation of this film and its actors and actresses. The other element of Noise is that it is an extremely well-written and directed Australian movie by Matthew Saville who manages to portray a variety of realistic and human emotions by his intense scenes and story telling. The story revolves around Graham McGahan (Brendan Cowell) who is a scarred police officer, both emotionally and physically and is sent to a suburban shopping strip in order to investigate a string of violent murders. To make matters worse, this is just before Christmas and McGahan also suffers from tinnitus. McGahan soon meets Lavinia (Maia Thomas), a possible witness of these horrible crimes who carries as much baggage as our hero and provides a link to the rest of the world. Noise is a carefully written tale that has a plethora of twists, some real, some fictional that make this a compelling tale about life and death within Suburbia and how the decisions we make effect the outcome and paths of our lives. Whether it's McGahan with his deliberating tinnitus or Lavinia who was left unscarred by the crime scene, it's complexity is engaging move and will leave you drawn in from start to finish. Saville should be complimented for creating such an engaging story and of course, the actors who really knocked the movie ball out of the move park. It's easily one of the most thrilling and well-made Australian movies to date. On Blu-ray, the video quality is far superior than the DVD version. The grain is almost gone and there is no artifacting whatsoever. Add in a Dolby Digital 5.1 soundtrack and this really takes the premise behind the story "noise", to a whole new level. Lastly, you have the special features that give you a backstage pass to almost every facet of this film from delete scenes to featurettes and an informative commentary track. Interviews with Matthew Saville, Brendan Cowell and Trevor Blainey from "At the Movies", "RRR", "Popcorn" and "Australia Talks"